Unlike Traditional Gymnastics where only bars are use to swing from and Rings are used to perform certain routines from, aerial acrobatics allows a more interpretive, stylistic, and creative edge. Still another great thing about Corde Lisse is that you can do release moves. A release move is when you swing or flip in some fashion let go of the Rope and then regrab it again. Rope is easy to spot and easy to grab making it a great apparatus for release skills. Here’s me attempting a release move. Next up we have Static Trapeze. Not to be confused with a flying trapeze. 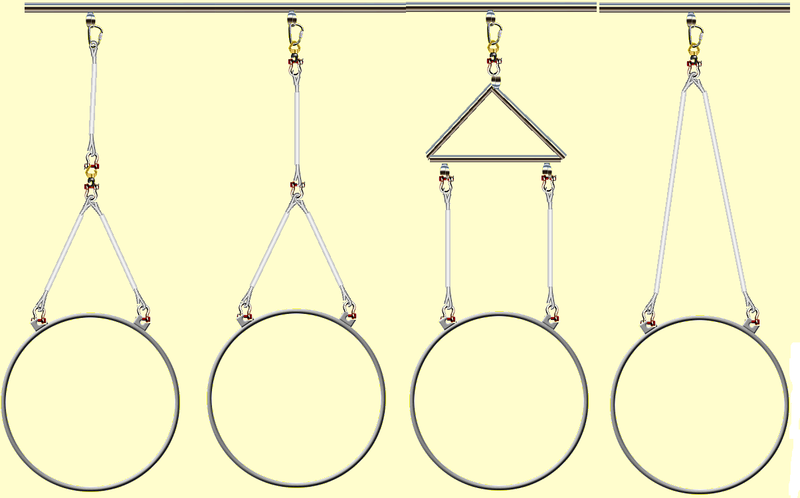 A static Trapeze usually has two rigged points but can be rigged to a single point to allow it to spin. This is probably third in line for strength requirements because it can move a lot and combines both ropes and a horizontal bar which makes it a fascinating tool to work with. At first glance most people would just want to swing on it, but to your surprise there are endless ways to wrap yourself up, weave in and out of the ropes, and go over and under it. 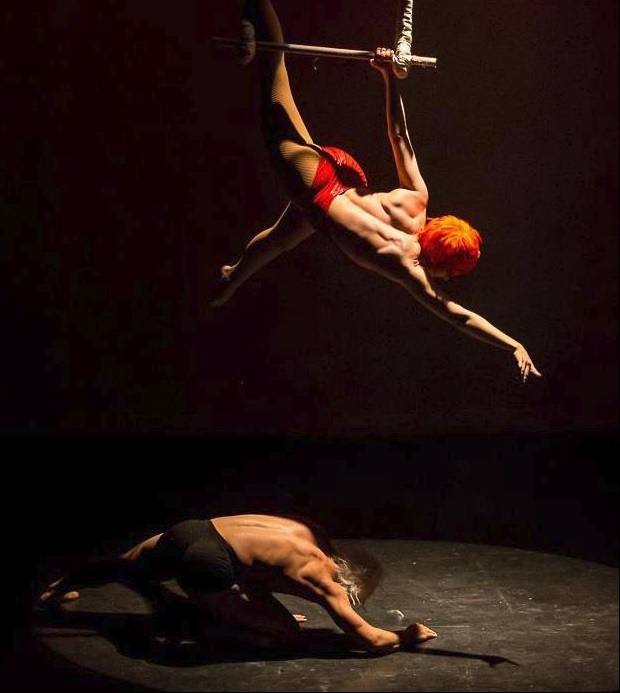 My first introduction to Aerial Acrobatics was through Static Trapeze and I liked that it had a familiar element of high bar from gymnastics and also the use of the ropes for creativity. I have seen a couple of release moves on Trapeze but they are tricky. 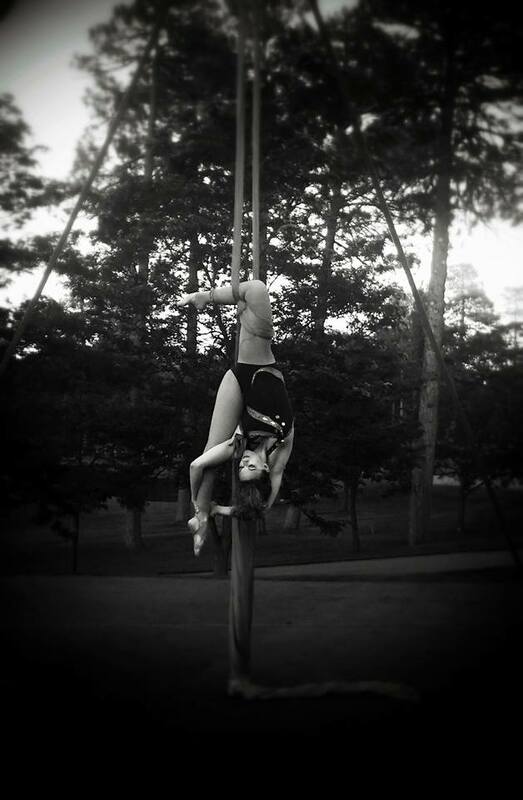 Below is Video of Khrystia St Lucia (also my soon to be wife :p) doing a new transitional skill on the trapeze. Silks are a single long piece of “2-way stretch polyester lycra or Tricot Nylon“ that is looped and knotted through a special carabiner to create two strands of tissue of any length you want running down beside each other from their rigging point. The best thing about Silks is that they can be turned into so many different tools. If held together they are a rope, if apart they are straps, if tied in a certain fashion they become a hammock. And they can be pulled apart making a draping cape affect. You can see just a couple of applications of silks below. The only problem with the silks is that there is so much fabric that it can sometimes get away from you as a beginner practitioner. I can tell you personally that even though I am strong I struggle a lot with the silks because they can move around a lot easier. Also release moves, if ever done, are a lot riskier because of the chance missing the silks. The Lyra is a giant hoop suspended either from a single point or a double point that goes into a single point at the rigging location as seen below with Khrystia and Holly. 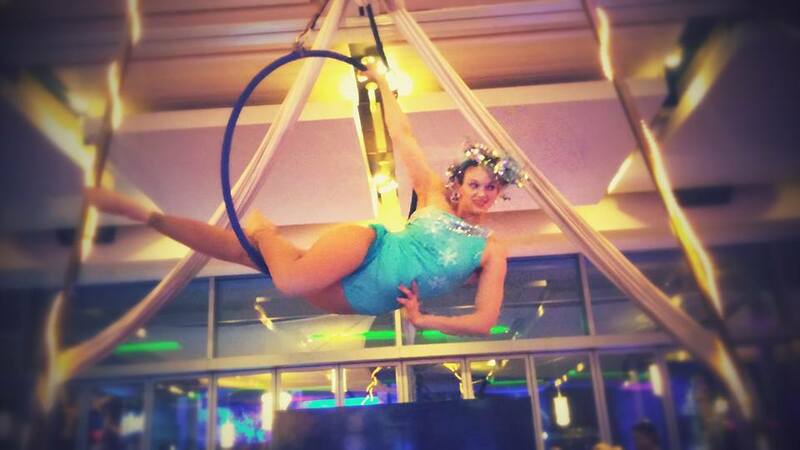 But you can see here in this photo from Aerial Arts FAQs that there are many other ways to rig that offer other performance options. The Lyra is great for super long performances because you can rest inside the circle in different poses like a hanging sculpture. The mere shape of it is very beautiful and pleasing to the eye even when the performer is not in motion. 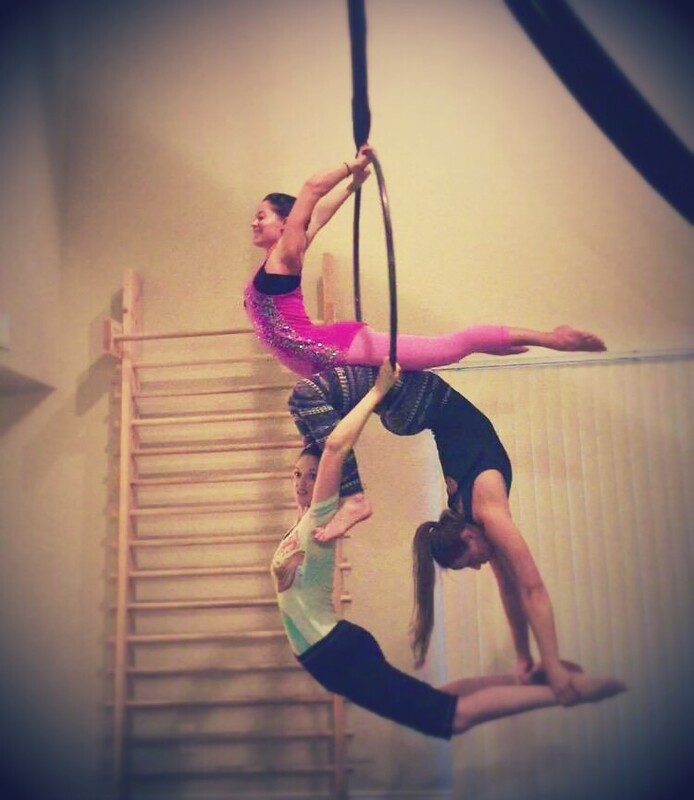 Because the Lyra technically has two strong horizontal supports it is excellent for multiple people acrobatics. It is also one of the easier apparatuses to directly decorate because it has so few moving parts. Look what Khrystia did with a single set of RGB LEDs. It adds another element to an already beautiful apparatus.